INTRODUCTION: Global trends suggest that the incidence of squamous cell carcinoma (SCC) has decreased but that the incidence of adenocarcinoma (AC) has increased. In South Africa, outdated data exist, thereby prompting this investigation. OBJECTIVES: To determine the incidence of oesophageal cancer in two 6-year periods in and around Gauteng Province. Further distinction was made based on gender, race and histological types. METHODS: A retrospective audit was conducted including histologically documented oesophageal cancer cases collected over a 12-year period from 2001 to 2012, which was divided into two 6-year periods. Incidence was calculated based on the 2013 Gauteng estimated population size. Statistical analysis was performed using the χ2 test. RESULTS: On the whole, there was a significant decrease in the incidence of SCC (p=0.0001). Significant decreases were seen in the African male and female groups (p=0.001 and p=0.0006, respectively). No significant difference was seen in the non-African male and female groups. A non-significant decrease was seen in the AC type with regards to gender and race. CONCLUSION: Reasons for the decline shown here are unknown as patient risk factors were not available. Furthermore, major healthcare centres were not included. These are points for future investigation. The incidence of oesophageal cancer has decreased since 2001, owing to the decrease in SCC in African males and females. Although the decreases in the AC type were not significantly different, they do not parallel global trends. In 2008 an estimated 482 000 new cases of oesophageal cancer were diagnosed worldwide, resulting in 407 000 deaths globally and making it the 8th most frequently diagnosed cancer and the 6th most likely cause of cancer-related deaths. Globally, squamous cell carcinoma (SCC) is the more prevalent type, accounting for 90% of cases in most European and Asian countries. [1,2] Observed trends over the last few decades show that there is a decreasing incidence of SCC in both high- and low-risk areas and an increase in adenocarcinoma (AC), especially in Western countries,[3-5] which is estimated to increase by 140% by 2025. In South Africa for the period 1991 - 1995, the incidence of oesophageal cancer was greatest in the Transkei region with an incidence in SCC of approximately 76/100 000 and 36/100 000 in males and females, respectively. While it is generally accepted that SCC is the predominant type, recent observations show that the incidence of AC is on the rise in certain population subgroups, a point not yet explored in the South African setting. The latest data from the 2008 GLOBOCAN database shows that southern Africa has the highest incidence of oesophageal cancer in the world. However, no data exist as to the incidence of AC and there are no current data in South Africa regarding trends in incidence. The objective of this study was to determine the incidence of oesophageal cancer in two 6-year periods as diagnosed at the National Health Laboratory Services (NHLS) at Charlotte Maxeke Johannesburg Academic Hospital (CMJAH). Additional aims were to determine the incidence of oesophageal cancer with regards to gender, race group and histological type. Ethical clearance was obtained from the University of the Witwatersrand Human Ethics committee. A retrospective audit was conducted on data from the NHLS at CMJAH and included all cases of confirmed oesophageal carcinoma based on histological diagnosis from specimens processed by the NHLS and whose results were subsequently captured onto the database. A time frame of 12 years from 2001 to 2012 was analysed. 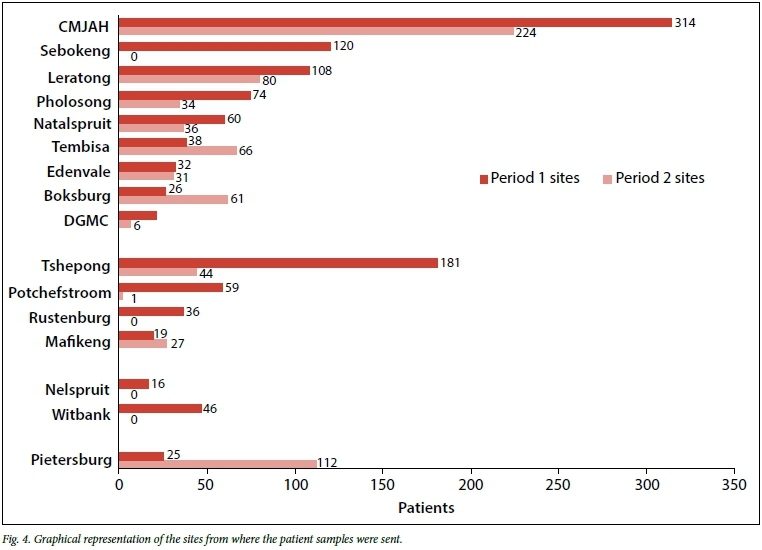 Variables considered for each histological subtype included gender, race (African or non-African) and referral site, with the top 10 sites reported separately and the rest grouped together. Patient anonymity was maintained. Incidence was calculated using the 2013 estimated population size in Gauteng Province, obtained from StatsSA. A comparison was drawn between two 6-year periods: 2001 - 2006 (period 1) and 2007 - 2012 (period 2). Statistical analysis was performed using Statistica, version 11 (StatSoft Inc USA). The χ2test was used with significance accepted at p<0.05. When comparing the combined groups (Fig. 1) presenting with the AC type, there was no significant difference between the incidence (0.24/100 000 v. 0.14/100 000, p=0.964) for the two time periods. In the SCC group, there was a significant difference between the two periods (2.27/100 000 v. 1.14/100 000, p=0.0001). Without considering gender and race within both groups, the incidence was significantly higher in period 1. 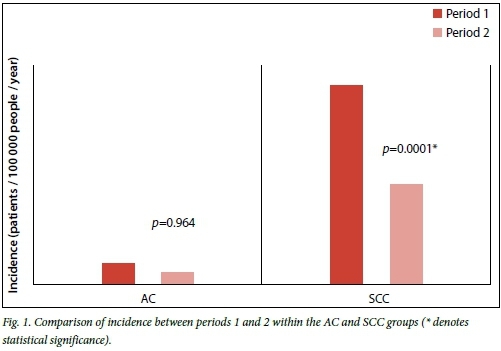 Comparison of the incidence of the SCC type (Fig. 2) between the two periods with regards to gender and race showed a significant difference in the African male (7.17/100 000 v. 4.06/100 000, p=0.001) and African female groups (4.49/100 000 v. 2.75/100 000, p=0.0006). There was no significant difference in the incidence of SCC in the non-African male (0.44/100 000 v. 0.46/100 000, p=0.116) and non-African female (0.43/100 000 v. 0.15/100 000, p=0.264). All groups demonstrated a decrease from period 1 to period 2. The same comparisons regarding AC type incidence (Fig. 3) between the two periods also showed a decrease in all groups from period 1 to period 2, but these decreases are not significantly different. The incidence for periods 1 and 2 in the African males was 0.43/100 000 v. 0.28/100 000 (p=0.803) and in the African female groups 0.23/100 000 v. 0.19/100 000, (p=0.254), which both show a decrease in the incidence of AC. In the non-African males, the incidence for periods 1 and 2 was 0.57/100 000 v. 0.37/100 000 (p=0.055) and non-African females the incidence was 0.10/100 000 v. 0.07/100 000 (p=0.35). When comparing the sites of origin of patient histological samples, the majority demonstrated a decrease in the number of samples sent to the NHLS labs at CMJAH during both periods (Fig. 4). There were, however, increases in the number of samples sent from Tembisa, Boksburg and Polokwane regarding the two periods. It is unclear why no specimens were received from Sebokeng during period 2. Data from the Department of Anatomical Pathology, CMJAH NHLS complex showed that on the whole, oesophageal cancer incidence had decreased over the 12-year period (2001 - 2012) in Gauteng, South Africa. When defined by race and gender, there is a decrease in both SCC and AC. 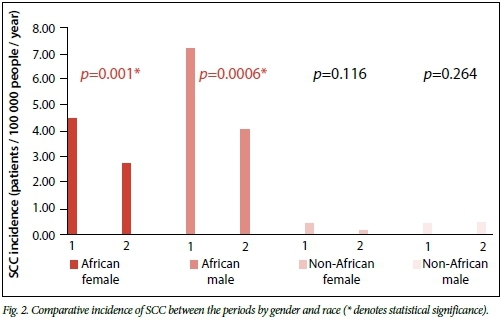 The decrease in SCC in African males and females is significant when compared with that of the non-African counterparts, accounting for the principal decrease in incidence in this study. Although there were decreases in the AC subtypes, these were not significant. This showed that the trend seen in the SCC subtype followed that of the international community. Our data show that within the greater Johannesburg area there is a decline in the incidence of both AC and SCC and thus an overall decrease in oesophageal carcinoma. This is in contradiction to what was seen by Lambert and Hainaut, where they showed an increase in the incidence of oesophageal cancer, notably in the cases of AC. 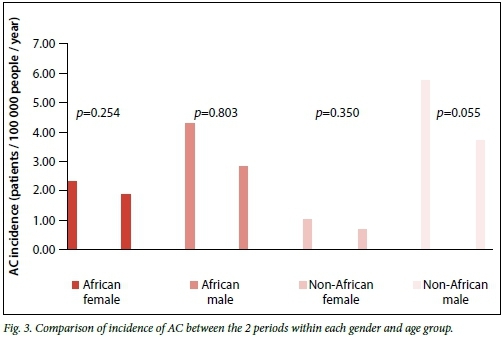 Although our change in incidence was mostly owing to the decrease in SCC cases in the African population, a decrease in the AC also contributed to the overall decline. Oesophageal cancer showed a marked geographical distribution and southern Africa is recognised as an area of high incidence in terms of the prevalence of this disease. Cancer of the oesophagus was a rare disease in the South African black population until the last few decades, but our data showed that the incidence in the African population represented here was much greater than that of the non-African population.™ This may be owing to the institutions from where the diagnoses originate and so relates more to the patient demographics of the government-sector hospitals. It could be that there was truly a decrease in the incidence of oesophageal cancer or there was the possibility that these patients were not being seen in the institutions represented in this study. Additionally, the sample size of the non-African populations was small and did not truly reflect the incidence here. Further investigations are warranted to include government and private institutions. It is important to note that this study excluded the incidence at Chris Hani Baragwanath Academic Hospital (CHBAH), which has a major patient catchment population. Anecdotal evidence from one of the authors at CMJAH (Anatomical Pathology, University of the Witwatersrand) suggested that the incidence of oesophageal carcinoma at CHBAH was also declining. It can therefore be inferred that the overall incidence in the Johannesburg area was decreasing. Gauteng is the most populated province in South Africa, and as a result this cancer as a burden of disease should be considered with regards to further research, potentially addressing risk factors. Resources are currently directed towards palliative therapy rather than a curative route owing to these patients presenting in the terminal stages of the disease. This leaves opportunities for the development of strategies for earlier detection and treatment. The latest data on the incidence of oesophageal cancer in South Africa originate from studies carried out in the last century and thus information from 2000 onwards is substantially lacking. The last publication from the South African National Cancer Registry was in 2005, leaving a 7-year deficit in figures on the incidence of oesophageal carcinoma. According to the GLOBOCAN database, southern Africa has the highest incidence of oesophageal cancer in the world. Our study had several limitations. Firstly, our data were based exclusively on the laboratory reports from the Department of Anatomical Pathology, CMJAH NHL complex, which in certain cases did not display the details of race and gender and thus some inferences were made based on the patient's name. The reports used were based only on a select few hospitals in and around Johannesburg and thus certain public hospitals, for example CHBAH, were excluded from the study, as were all private sector-based laboratory services. As the study was done in retrospect, there was also no access to information on individual patient risk factors and thus no trends or observations could be made regarding the link between potential risk factors and the two main oesophageal cancer subtypes that were considered. Another factor that can be considered a potential shortcoming is that the sample size was not large enough to account for particular race subgroups such as white, coloured, Indian, etc., and thus only two broad categories of African and non-African individuals could be assessed. Nationality of the patients was also unable to be attained and this is a component that could potentially skew the results that in essence should reflect an exclusively South African-based population. In our study, we had no indication as to the exposure of our patients to any risk factors and so it is difficult to find any substantial causal relationship for the change in incidences that we have reported. Important risk factors include the association of obesity and Barret's oesophagus, Helicobacter pylori infection, Fusarium spp,tobacco and alcohol. The aforementioned factors are well described but here we discuss contradictions to the first two factors. Studies have shown that obesity is a potential risk factor for the development of oesophageal carcinoma, possibly owing to the effects of raised intra-abdominal pressure causing gastro-oesophageal reflux disease. This is associated with Barrett's oesophagus, a metastatic precursor to carcinoma. Studies conducted in the USA highlight the significant association between AC and the incidence of obesity. Interestingly, South African black females display a higher prevalence of being overweight or obese with rates higher than those seen in the female population of the USA. Yet while AC is on the increase in the USA among females, our study showed a differing trend. Another factor to consider is the prevalence of Helicobacter pylori infection. In First-World countries such as the USA, the UK and Denmark, the prevalence of H. pylori is decreasing within the population due to improved sanitation and increased use of antibiotics. H. pylori infection has been shown to be a protective factor against the development of AC of the oesophagus as it decreases the acidity of the stomach and thus minimises the effect of reflux. The incidence of AC has increased in the above-mentioned countries and the negative association with H. pylori infection is a possible explanation for this. In South Africa, H. pylori infection rates are extremely high and this protective factor may be contributing towards the decreased incidence of AC as opposed to SCC. In conclusion, the incidence of oesophageal cancer at government-sector hospitals in the greater Johannesburg area (Gauteng) appears to be decreasing. The major changes seen were a decrease in the incidence of SCC in African males and females. Interestingly, there is a non-significant decrease in AC incidence, which is not in keeping with international trends where an increase in AC is seen.